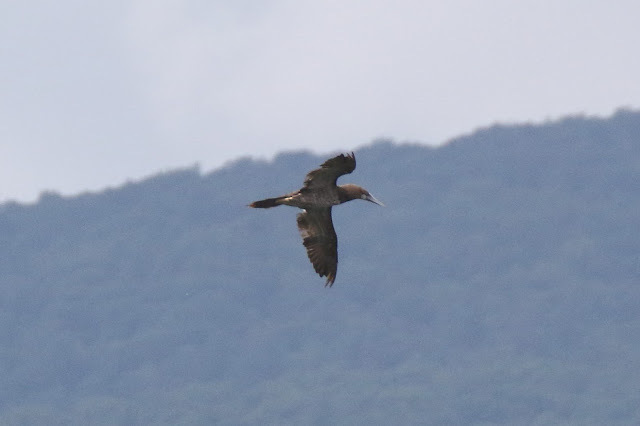 MA - a Brown Booby in Berkshire County! Brown Booby - Onota Lake, Pittsfield, Berkshire Co., MA. August 18th, 2018. Rene Wendall posted welcome news of a Brown Booby at Onota Lake in Pittsfield on August 17th. The bird seemed settled and allowed plenty of local birders to catch up with it that day. The following morning, a window of time opened for me too and after a timely post from Jonathan Pierce I headed west embarking on the ninety minute drive from Northfield to Pittsfield. I needn't have rushed! After I arrived the bird sat quietly on the water for the best part of two hours before actively foraging around the north end of the lake off Burbank Bank. It was worth the wait, it looked so much better in flight careening over the water and plunge diving, successfully taking fish on multiple occasions. Apparently, only the second for interior Massachusetts and fitting well within a pattern of recent inland freshwater occurrences with birds documented from Vermont and upstate New York in the last few years. On a personal level, this was my third Brown Booby in Massachusetts, the other two coming from Outer Cape Cod, both of those being in late August. Gracious thanks to Rene Wendall for getting the word out and to Jonathan Pierce and Sheila Carroll for keeping us up to speed on the bird's presence via social media.